A place where people of all faiths and walks of life come together to celebrate Holy days, holidays, and the holy in the every day. We will be about thriving, not just surviving, about respecting the rituals of the past while boldly imagining a more vibrant future. We will build a courageous place that opens its doors to people of all faiths and backgrounds, a place that honors each other’s humanity and that works to spread a message of inclusion through music, dance, prayer and communal celebration. Originally built by Sinai Temple in 1909, the Pico Union is the oldest synagogue building in Los Angeles. For 88 years, it was lovingly preserved by the Welsh Presbyterian Church. 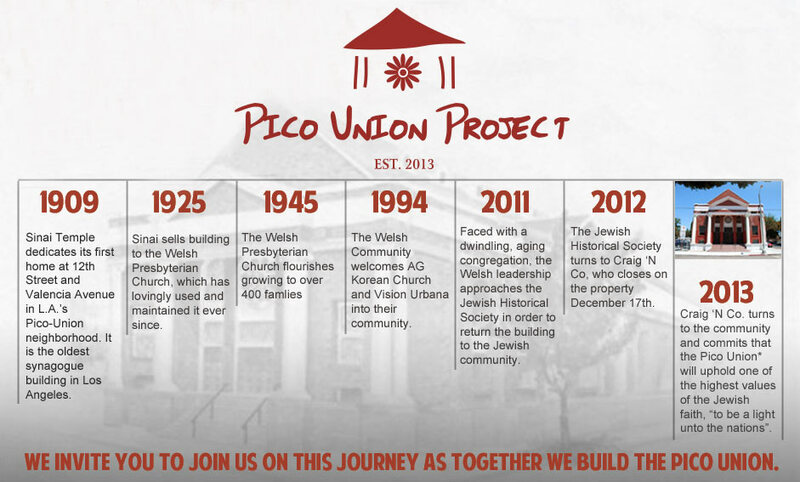 Now we are embarking on a new beginning as an interfaith community center, fulfilling the ancient Jewish value of being “a light unto the nations.” Centrally located in the heart of Los Angeles, the Pico Union is ideally situated to be a center of culture, arts, social justice and learning.